Students in third through fifth grade have probably spent several years learning about narrative structure. As they begin to learn more about informational text, they have to reframe how they think about text because informational text can be nonlinear. This means that it does not have to be read in the same way by everyone. Readers can “enter” the text in multiple ways. This is particularly true for digital text. Think about a website: one reader might navigate the content very differently than another reader. The entry points are different. This standard demands that students recognize the different entry points and what function they serve. These entry points are the text structures, and these structures can be physical or organizational. 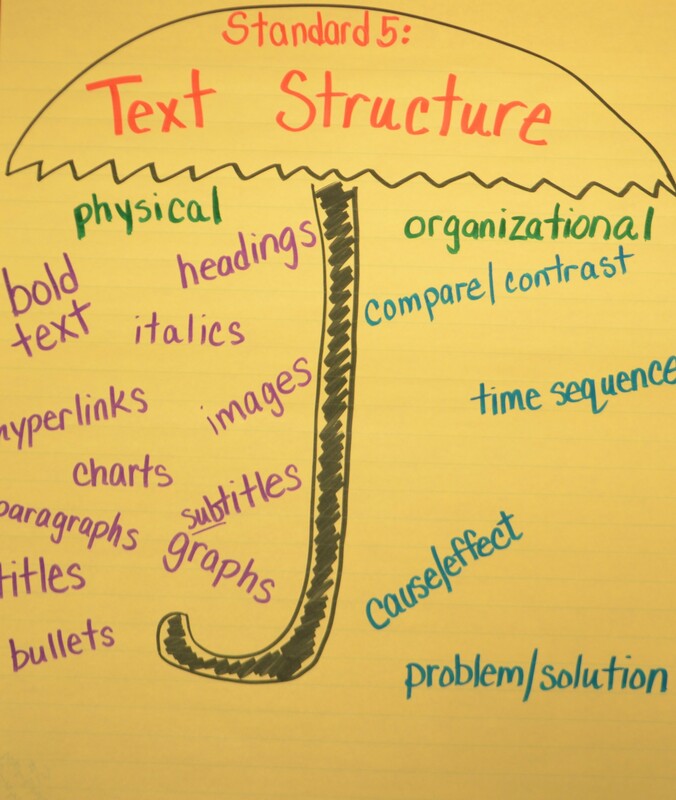 When teaching the Text Structure standard there are two different areas to consider: physical text features and organizational structures/features. Each grade level focuses on a speciﬁc aspect of the standard. In third grade, for example, students are expected to understand the physical text features. These include hyperlinks, bullets, headings, sidebars, chart, graphs, etc. In fourth and ﬁfth grade, the focus is no longer on physical text features; students are expected to look at the organizational structures of the text. In ﬁfth grade, students continue to look at the organizational structures of the text, but expand to include multiple texts. I find that it is critical to give students a visual to separate the two types of text structures. This helps them to more explicitly consider both types when they are reading informational text. The anchor chart pictured here is what I use to remind students of the differences when I first introduce the concept of structure. We move on to explore each type listed under organization and physical. This allows me to share examples of real text with the students that incorporate the structural variations. I will share some of the activities and anchor charts that I use to help students make meaning of those structures later in the week as well.